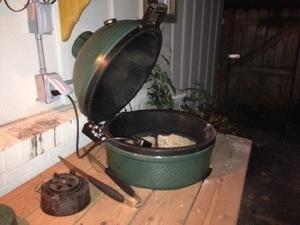 I have a good friend who recently received a Big Green Egg as a Christmas gift. He’s without prep space at the moment as he and his wife have been remodeling their kitchen and I am sad for his Egg as it sits lonely on his patio, all white and pristine. I thought I’d toss him a bone on the burn in procedure for the Egg and realized that, while I had a blog post for indirect heat, I hadn’t done one for direct heat. Although the Egg is made to cook at 700-800F, it does not come prepared to handle that sort of temperature. If you let it get that hot the first time, you’ll burn your gasket off and you run the risk of cracking some of that lifetime warranty ceramic. Step 1. 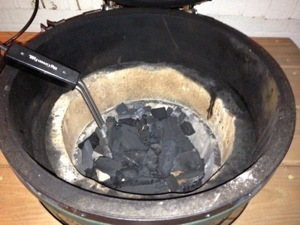 A (relatively) clean Big Green Egg. 2. Pour natural lump charcoal until the fire bowl is full of coal. 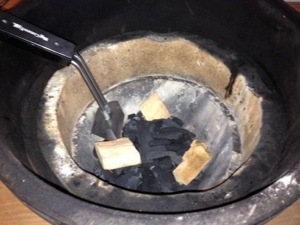 Use the ash tool to clear out a small hole in the middle of the pile of coals. Please ignore that I used smoke wood and an electric starter. In real life, the new EggHead will be using fire starters. 3. Light one of the Fire Starters. Drop it in the hole in the top of the coals. 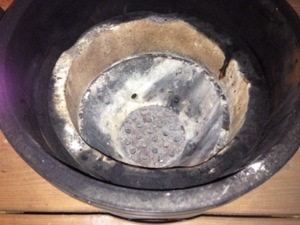 This will serve to light several of the coals, but still give you the ability to control the airflow as the fire takes off and you need to regulate the temperature. Open the bottom and top vents all the way for maximum air flow. As you are using Fire Starters, go ahead and drop the cooking grid into place and close the lid. 4. Let the grill pre-heat. Do not leave the grill unattended. You’ll want to start adjusting the vents when you get within 25 – 50 degrees of your intended temperature. For an initial burn in, you’re looking to let the Egg burn for an hour or so at 350F to 400F. 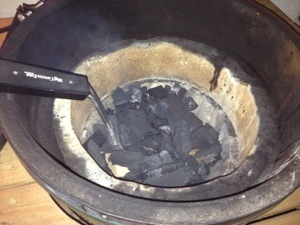 Start by closing the lower vent to about the half way point as you pass 300F. Close the DMFT so that the small vent holes are all the way open, but the large opening is all the way closed. Pro tip: Keep the two screws in your DMFT lined up and on the same plane as your Egg opens. This will keep you from having to reset it every time that you need to open the Egg to flip your meat. Don’t leave it open for too long because a), your fire will get away from you. And b), if you’re looking, you ain’t cooking! 5. 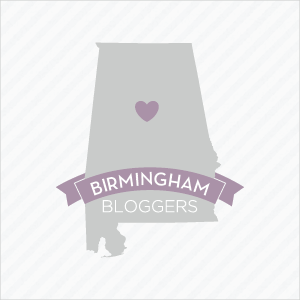 Watch the dome thermometer. It will fluctuate as your temperature stabilizes. If it drops below 350, open the lower vent very slightly. If it gets above 400, close the lower vent very slightly. It will take a few minutes for your adjustments to reflect in the dome temperature. Feel free to play with the DMFT vents as well and you’ll start to get a feel for how temperature control works. You should be able to dial in dome temperatures to within 10-25 degrees or so of a target with a little practice. For direct cooking purposes, 10-25 degrees might as well be on target. 6. After the grill has burned for an hour or so, close the bottom vent. Remove the DMFT. And put the ceramic top over the top vent. This will choke out the fire and leave you with coal for your next cook. This same technique can be used for cooking at temperatures anywhere between about 300F and 800F. You can cook pork chops, steaks, burgers, chicken breasts, fish, kebabs, vegetables and just about anything else using this method. Until you have the platesetter, direct cooking is really your only option. Cook on the Egg two or three times in the neighborhood of 400F (grilled chicken, pork chops, fish, etc) before trying to sear a Ribeye at 750F.